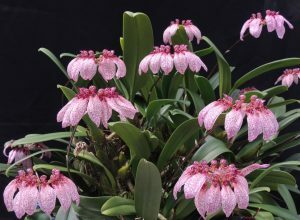 This magnificent bulbophyylum species has been a star plant in our collection for more than twenty years and every summer we are treated to its intriguing and dramatic flowers. 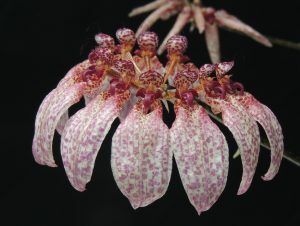 Bulbophyllum eberhardtii comes from South East Asia and is found from 1000m to 1500m altitude indicating a species that will enjoy intermediate temperatures. 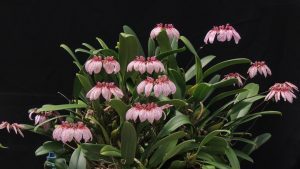 We find that it does very well in either Warm Asia, Warm Americas or Cool Americas, so a minimum anywhere from 12C to 18C suits it making it a very adaptable plant. With us the warmer growing plants flower first but it is easier to manage a little cooler as it seems to enjoy being damp and we water the plant throughout the year. We find that small plants enjoy the extra moisture provided by a pot but larger plants do best in a basket as it is easier to manage the long rhizome and avoiding the problem of plants wandering from their own pots and rooting in others nearby. Over time specimen plants will form a lose ball especially if straggly bits are tied in and that is how we have managed the giant plant shown here. We have two distinct clones of the species and look forward to growing plants from seed in the near future.